The secret, I’ve found, is adding a few crunchy little pieces of chicharrón (also known as pork rinds or cracklings here in the U.S.). They add a depth to the soup’s flavor that I’m convinced cannot be achieved otherwise. All of my favorite places in Mexico for tortilla soup serve it similarly; all the ingredients for assembling the soup are brought to the table separately and the waiter puts it together right in front of you, almost like a little show with your meal. In a few weeks, the Tortilla will morph into a traveling food blog as I’ll be visiting Mexico City and will be posting photos and names of my favorite places for tortilla soup and other dishes in the Distrito Federal. There are two methods I use for making chicken stock, and which you choose will depend on how much time you’ve got. Slow cooking is preferred as it will have a much richer flavor, but the stovetop method works just fine if you’re short on time. I usually make the chicken stock the night before to cut down on prep time the day I want to eat the soup. Slice 1 medium sized onion and place along bottom of 4 ½ quart-sized crock pot. Place one whole roaster chicken (either raw, or a precooked plain rotisserie chicken) on top of the onions and add enough water to cover most of the chicken. Set on high for about 8 hours. Cook until chicken easily falls from the bone with some gentle prodding from a fork. (This can also be done overnight if you set the heat to low, and you can cook it for up to 12 hours without worry.) If you use a precooked rotisserie chicken, you probably will not need to add any salt; if you use a raw chicken you should use a good-sized pinch of sea or kosher salt. In a large stock pot (4 quarts or bigger), place the sliced onion on the bottom, the chicken on top of the onion, and add enough water to cover the chicken. Heat over a high flame until it starts to come to a boil and then reduce to medium-low heat for about one hour or until the breast meat is cooked through. Add a few teaspoons of sea or kosher salt. Either way, the stock will be somewhat concentrated, but more so with the Crockpot method. If you slow-cooked the stock, you should use about 1 ½ cups of the concentrated stock added to 4 to 4 ½ cups of water to create a broth. If you cooked the stock on the stove, you may want to use 2 cups or slightly more of the stock added to 4 cups of water for the broth. You can reserve the rest of the stock and meat and use it for other soups or dishes if you wish. I usually just discard all the onions and reserve the leftovers for chilaquiles or a simple caldo de pollo. On a hot comal, roast the garlic, onion and tomatoes. 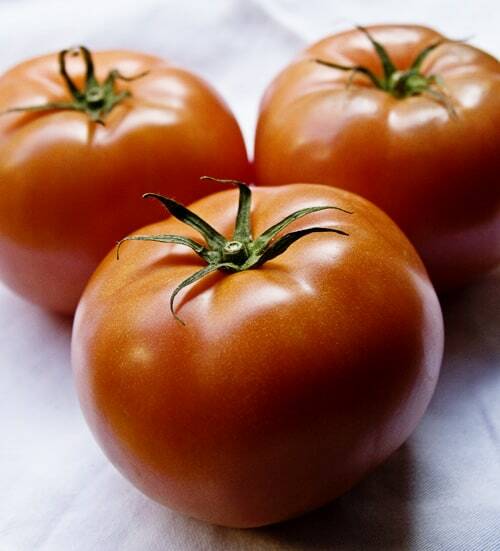 When the tomato skin is slightly blistered and darkened, peel the skin off, core the tomatoes and gently remove the seeds. Be careful when peeling the skins, as the tomatoes will be very hot. The onion and garlic should be slightly charred. Put the tomato, onion and garlic into a blender or a food processor and add about ¼ cup of chicken stock to moisten. Blend until completely smooth. Heat the tablespoon of oil in a pot and pour the tomato mixture over it. Fry the puree on high for about two minutes and then reduce to medium heat, stirring for about 5 minutes or until the puree thickens and gets a little darker in color. Add the chicken broth to the fried tomato mixture and add a little bit of salt and pepper to taste. Cover and cook over medium heat for 15 minutes. Sometimes instead of adding salt, I add a little bit of Knorr caldo de tomate. If you opted to use epazote, you’ll want to add it to the pot before covering and remove it and discard after 15 minutes. If you plan to serve the soup later, just remove from the heat and let cool to room temperature before storing in an airtight container. Cut the chiles in small rings and remove the seeds. Fry them quickly (just a minute or two) in the leftover oil to bring out their flavor and slightly rehydrate them. Drain the excess oil on a paper towel. 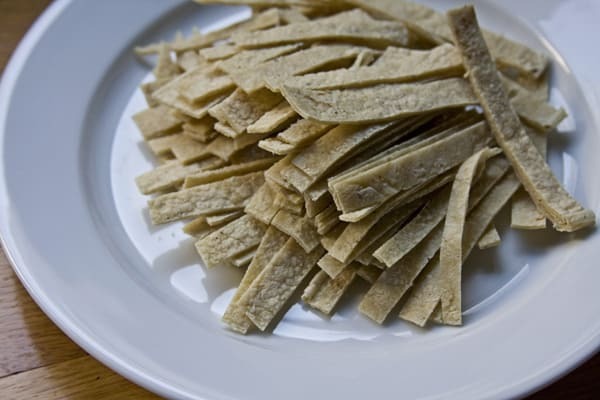 Ladle the soup into a shallow bowl and add a handful of tortilla strips in the middle. 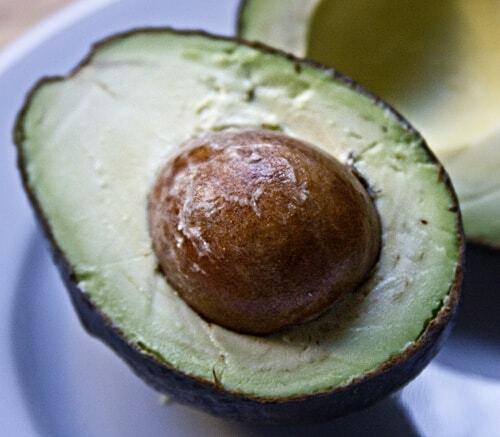 Add the avocado, a few chile rings, a dollop of the crema and a sprinkling of cheese. If desired, squeeze a little fresh lime juice into the broth. Add a few small pieces of crunchy chicharrón. Yields 4-6 servings depending how generously you serve. Lasts about a week in the refrigerator or a little over month if you freeze the broth. 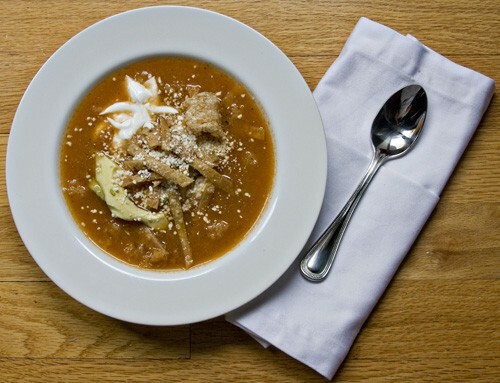 How do you like your sopa de tortilla? What are your fond memories of this dish? Chicharrón? Who knew?! Love the recipe and can’t wait to test it out. Maura – What a fantastic blog! Your photos are amazing. I will definitely try this recipe – and make sure to use you for Mexican inspiration moving forward. Taco nights are going to be a lot more exciting! This looks so yummy! Will have to try! I will have to link from my blog!